In addition to the Country Store and Symphony partnership at Friday’s reception, there are a number of other special features to this year’s show. Most artists will be available during both Friday and Saturday hours to meet and greet show attendees and many will be demonstrating their craftsmanship. Attendees will have an opportunity to participate in a silent auction. Artist Selinda Kennedy has crafted a commemorative redware “butter mold” tile that will be available for purchase from the museum’s booth; it will also be a complimentary gift for purchases totaling $1,000 or more. Artists Steve Getz and Judith Cole Youngman collaborated in the design of “Quilts of Muncy,” a limited-edition poster using a collage of quilts created by Youngman. The poster will be debuted at the 2014 Artists Exhibition. The society’s art show committee wants to ensure that show guests experience a well-rounded event that includes a wide range of artistic expression– diversity and excellent artistry remain paramount to the selection process. The show will feature some of the most talented artists in Pennsylvania whose works are exhibited and collected nationally; many share a close relationship with Lycoming County and the surrounding area. It includes a wide range of arts and craftsmanship, including photography, oil painting, jewelry, fashion, pottery, metal- and wood-working, quilting, mosaics, watercolor, sculpture, and home décor. The show will be a rich and varied collection of original work along with signed and numbered limited-edition reproductions. This year’s artists include Michael Coppes, Tammy Daneker, Linda Doucette, Dorothy Fisher, Richard Karp, Jeff Keiffer, Selinda Kennedy, Laura Knorr, Deb Parsons, Kris Robbins, Mark Robbins, David Seybold, Roger Shipley, Theresa Crowley Spitler, Bruce Storm, Nella Godbey Storm, Sue Swisher, Christine Washack, Wynn Yarrow and Judith Cole Youngman. Karp, Keiffer, and Swisher are new to the show this year and Fisher returns after an absence of several years. “A panel of independent jurors evaluates new applicants and selects from our stable of previously-juried talented artisans those who will be asked to participate in the current year’s show. While each exhibition is different, a small number of our artists are core to the show. 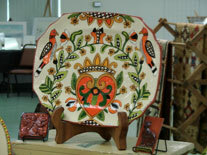 We are careful to offer a mix of traditional and contemporary styles and techniques from oil paintings to acrylics to mixed media and this year we have expanded our artistic categories to include shore birds and decoys, punch needle pictures and hand knit felted purses,” said Linda Poulton, show coordinator. This year’s exhibition benefits the Muncy Historical Society’s development efforts at its Heritage Park and Nature Trail under way in the Port Penn section of Muncy. Arts funding support has been provided by Gary’s Furniture, 3 Factory Street, Picture Rocks; state funding through a grant from the Pennsylvania Council on the Arts, an agency funded by the Commonwealth of Pennsylvania and the National Endowment for the Arts; and Thelma White. The Muncy Historical Society’s Artists Exhibition also benefits from the support of Lycoming County Visitors Bureau. Directions to the Artists Exhibition and Show: I-180, 220 N exit, EXIT 15, toward Pennsdale; take 220 N approximately 0.3 mile; make slight left onto Village Road; Social Hall on left, 0.3 mile. Michael Coppes Mike got his first camera, a Kodak 110 Instamatic, when he was eleven years old. His interest in photography remained strong through high school where he utilized the school’s cameras and darkroom. After graduating from the Muncy school system he went on to study photography at the Art Institute of Pittsburgh earning a degree in Photography/Multi-media. He remained in Pittsburgh for 13 years before returning to Muncy. Mike is drawn to the works of Walker Evans, Dorothea Lange, Edward Weston, Ansel Adams and Henri Cartier-Bresson. He works as a free-lance photographer who enjoys shooting a very diverse array of assignments. Tammy Daneker The force behind Textures Bags & Etc., Tammy is a totally self-taught seamstress and artisan. Textures was formed 10 years ago as a home design company specializing in interior design and color consultations, custom window treatments and designer wall finishes. Tammy hand-crafted handbags, clutches, aprons and other accessories for fun for herself and friends but demand became so great that they became a large part of her Textures business. She strives to make handbags that are both functional and beautiful. She offers several styles of clutches and bags from tiny to extra-large, funky to utilitarian, casual to luxurious, and all are made from her own designs. Designer and vintage fabrics are used as well as hand-printed and screened fabrics to construct bags that are unique and special. Linda Doucette Linda recalls using a paintbrush before learning to write. The patchwork of the local countryside, flower gardens and sunshine sparkling on water all piqued her interest in the interplay of color and light. She worked in the textile industry for twenty-six years, designing lace, knits, prints and woven fabrics for home furnishings and apparel. It was inevitable that her textile and painting sensibilities would eventually merge as they have in her latest series of acrylics and inks on paper. These pieces involve two or sometimes three paintings which she strips down into paper warps and wefts. She then weaves the strips together to create a new painting, sometimes applying additional images on top of the work. The undulating painted strips combine to create unique color and textural effects. Linda is also a hand weaver, a spinner, an avid natural dyer, and is now experimenting with making handmade paper and these interests are finding their way into her paintings. Dorothy Fisher Intrigued with designing in gold and precious gemstones throughout her college years, Dorothy advanced her education in 1993 at the Gemological Institute of America in New York City, earning degrees in both precious metals and gemstones. From her studio nestled high in the Endless Mountains range of Sullivan County, she has won much acclaim for her artistic designs. From original concept, to sculpting in wax, to the finished product, attention to detail and design are given to every piece of her hand-crafted jewelry. Old-world training and experience, combined with state-of-the-art equipment, and tools, plus her passion for beauty, her dedication to excellence and her unique vision ensure a collection filled with elegant, wearable art. Richard Karp Richard grew up in Williamsport and has loved cameras and photography since his boyhood. He learns by looking at the work of others as well as using his own interpretive senses. He shoots his experiences, loves the play of light when it is low in the sky and enjoys the mix of color, form, shadow, texture and character. Regional architecture and nature photographs comprise his latest areas of recognition. After adventures in New York, California, West Virginia and Washington state he settled back in Williamsport around 1976. He has degrees from Penn State and W.A.C.C. and is retired from a computer career and involvement in a family business. Jeff Keiffer Jeff has been carving decoys for over 20 years. Most of his decoys are considered “Contemporary Antique.” Using the same tools as the great carvers of the past, he tries to make each decoy look like it was used 100 years ago. He has been competing in the “antique style” category at major decoy contests for the past several years. His greatest carving accomplishment was placing second best of show at the Ward Foundation World Championship competition in 2009. He has received over ten Best of Show ribbons from competitions on the east coast. Living in the Muncy area, he enjoys participating in any outdoor activity with his three children. Jeff is involved in many conservation organizations and he hopes you enjoy the decoys. Selinda Kennedy Selinda has developed her own signature in her own line of redware ceramic platters, bowls and decorative tiles. She employs 17th, 18th and 19th century motifs, inspired by famous examples of folk art found in museums and private collections. These traditional designs are derived primarily from German folk art imagery: song and book plate vignettes, powder horn engravings, and fraktur patterns. Using a traditional drape mold technique she utilizes antique forms in a variety of shapes and sizes for her canvas in redware. Through research of period designs she creates a unique collection of symbolic images combined with new color and detail. Each piece is hand-decorated with brushes and fine detail using engobes and glazes and fired in her kiln. Laura Knorr This Pennsylvania native has been strongly influenced by the color and originality found in nature, especially animals. For Laura it is a great treat and challenge to give human qualities to creatures and gratifying when the viewers, particularly children, find enjoyment in her work. The “Golden Age of Illustration” has inspired her throughout her life from N. C. Wyeth to the artwork of the Saturday Evening Post and various popular magazines of the 1950s. Her style is created with oil, acrylic and pencil on watercolor paper or canvas. With her return to Pennsylvania, she is experimenting with new media and subject matter which represent a new chapter in her life just by…coming home! Deb Parsons Deb Parsons studied various forms of glassmaking for 23 years, and in 1996 made it her life’s passion. Most of her formal studies were at the studio of the Corning Museum of Glass working with internationally renowned glass artists. Her body of work is a translation of earth elements – such as rocks under water. She uses a combination of highly saturated colored glass with pure metals and powders to produce the inclusions found naturally in raw minerals. Deb expresses her work through glass and sterling silver sculptural jewelry, hanging ornaments, glass and copper garden sculpture, and custom work for the home. Kris Robbins Kris grew up on his parents’ organic farm outside of Muncy and that greatly influenced his art. He saw all kinds of bugs, butterflies, and flowers while working around the farm and was always intrigued by them. After high school he studied auto body at Penn College where he learned to weld and paint cars. He applies these same skills to his sculptural metalwork. He sculpts, welds, and bends metal into unusual plant hangers, garden stakes, rain gauges and shepherd’s hooks embellished with flowers, birds and bugs. These are then painted in lively colors with auto body paint for a lasting finish. Mark Robbins It wasn’t until Mark was in 8th grade shop class that he turned his first bowl and he has been hooked on spinning wood ever since. Mark’s workshop is nestled amongst the pine trees on his organic farm outside of Muncy. Many of his finished pieces had their origin on the farm or the surrounding area and he creates his work from wood that has insect damage, worm holes, or bark inclusions. He strives to give his work “life” by creating smooth flowing lines contrasted with texture and carved elements. Harvesting the wood to be used, roughing it out, drying and completing the piece may take a year or more. Mark is a juried member of the PA State Guild of Craftsmen and the American Association of Woodturners. David Seybold With a strong passion for art, David left all teaching opportunities to pursue his life-long dream. A positive attitude and believing in oneself and talents helped David to develop a recipe for success. “Never stop believing in yourself; you are only going to be as good as you want to be.” Initially working in oils he now prefers to work in acrylics. His favorite subjects range from landscapes, colonial stone homes and farm scenes…to the antiques and primitives used in his still life paintings of harvested fruits and flowers. Roger Shipley A graduate of nationally- and internationally-recognized art study programs, Roger has taught painting, drawing, printmaking, color theory and two-dimensional design. As an artist he works in a number of varied media. In sculpture, he has completed works in Plexiglas and cast bronze expressing the interplay of organic detailing with simple forms. His paintings are in oil, watercolor, and gouache; his printmaking works are in intaglio, collagraph, monotype, serigraph and lithography; his drawings are in graphite and colored pencil, charcoal and pastel. Roger’s works depict impressionistic landscapes, seascapes and abstract form. Bruce Storm Bruce continues to take inspiration from the Muncy area, his garden, Lycoming County and the Islands of Campobello. After another sell-out year in 2013, Bruce has begun composing paintings through his laborious process of writing ideas that will be followed by en plein air sketching and, lastly hours of painting in layers, typically seven transparent applications in any given spot. Texture and patterns inspired by his Mother’s quilts add to his unique style. Nella Godbey Storm Nella teaches adults in advanced painting classes in State College for one semester each year. When not engaged in creating acrylic paintings on canvas she can be found designing and making terra cotta opus sectile mosaics. Nella pursues three careers—as a painter, mosaic maker and as an architectural color consultant. This year the double theme of groups of animals (repetition of shape) and Lycoming County skies dominates her work. A four-week tour of museums in England and France added insight and verve to her work, which reflects Lycoming County with Bald Eagle Mountain the star player. Christine Washack Chris has always been artistic and has expressed that through many forms over the years including antique reproduction game boards and employment as a stained glass artist. She and her husband developed a love of the 18th century after attending an 18th century market fair nearly nine years ago. That is where she saw her first floorcloth and became completely fascinated with them. Through years of trial and error, and lots of research, she is now able to offer a top quality floor covering that will last for years. Wynn Yarrow In Wynn’s own words, her “.paintings are landscapes as metaphors for the inner life. I have long been drawn to transition in nature: shifts in season, light and the sky. In human emotional life, transitions are times of vulnerability, but bring the potential for swift and positive change. Clouds have an ephemeral quality, yet yield tremendous power. To meet the sky one is forced to look up: a deeply hopeful act. Night presents an alternative reality, one that relies on our powers of memory, insight and imagination.” Her work exists in the shadowland between technique and vision, emotion and intellect, the physical realm and the spiritual one. Color fascinates Yarrow: its optical effects, its history, its symbolism and emotional content. She teaches Design and Color and Drawing at Pennsylvania College of Technology. Judith Cole Youngman Like many of her generation, Judith’s interest in quilting was ignited by the Bicentennial observation in 1976. Enough time and completed quilts have passed since then to catalogue ’numerous styles’ and ’experts’ that influenced her development as a quiltmaker. However, the major inspiration has been, and continues to be, the quilts made by our 19th century foremothers. Anonymous yet powerful, their influence has impacted every creative choice she makes. Recently she has been drawn to studying the connection between the spiritual and creative. Quilting is the art that she does. There is no ego involved, and the process remains far more important than the product. The supreme Creator nourishes her spirit and her work is offered as a tribute to Him. Each artist has donated a work for the silent auction this year. Auction will remain open from Friday 5:30 pm until Saturday at 1:00 pm when bidding closes. Winning bidders then will be identified and notified. Buyer button required to bid. Selinda Kennedy crafted a commemorative redware ‘butter mold’ tile that is available for $20 from the museum’s booth; it also will be a complimentary gift for purchases totaling $1,000 or more. Using a collage of quilts created by Judith Cole Youngman, artists Steve Getz and Youngman collaborated on the design of this limited edition poster making its debut at the show. Most artists will be available during both Friday and Saturday hours to meet and greet show attendees and many will be demonstrating their craftsmanship. Note: If you wish to purchase art or bid on an artwork in the silent auction a buyer button is required. Please sign in at the door to obtain your button on both Friday and Saturday. Cashiers will collect buttons when payment for artwork is made at the end of each day. Lycoming County Visitors Bureau and Thelma White.